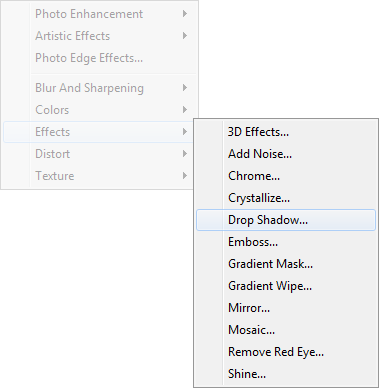 This section will show you how to add drop shadow effect to an image with more than one layers. We will use the following image "Sample-photo.jpg" as example. It can be within your website or at an external folder. For this guide, we assume that it is within the website. Click on the down arrow of this button on the top left corner. Select New Image -> Blank to open the New Image Dialog. Set the width to 290 and height to 213. 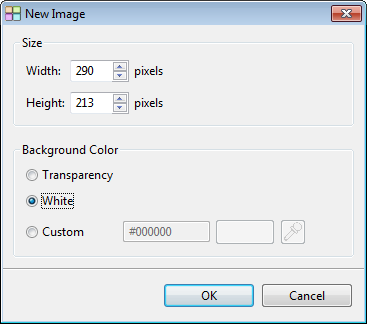 Select white for the "Background Color". Press the "OK" button to create the image. 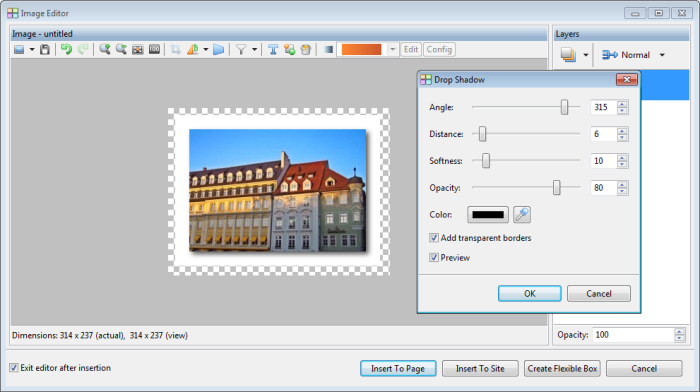 Click on the down arrow of this button which is on the toolbar of the Layers panel. 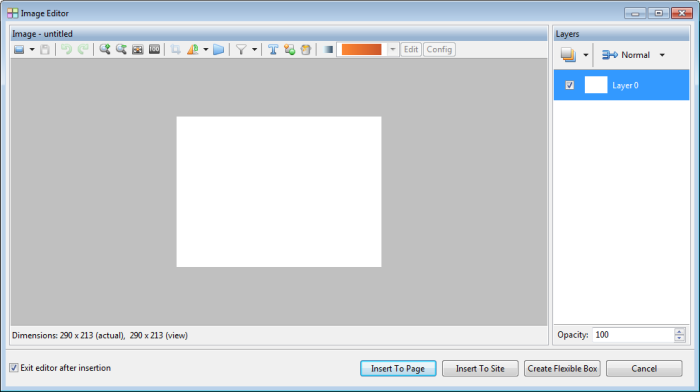 Select New Layer -> From Current Site to open the Load Image Dialog. Select "Sample-photo.jpg" from the drop down menu. Press the "OK" button to load the image to the layer. 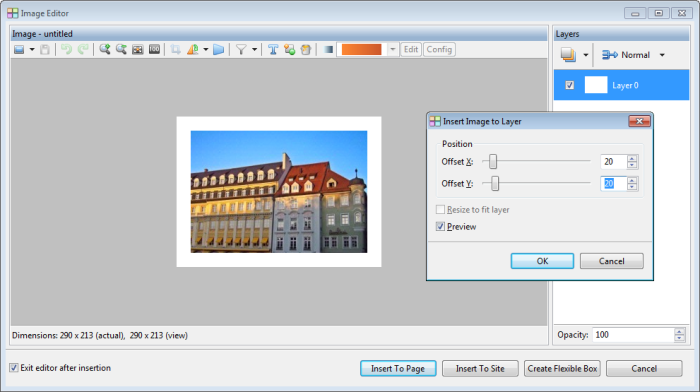 The Insert Image to Layer Dialog will be opened. 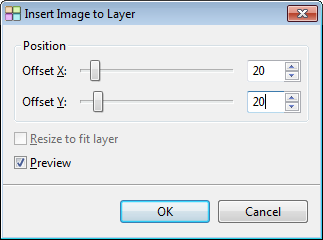 Set the values of both Offset X and Offset Y to 20 to move the image to the middle of the layer. Press the "OK" button to save the settings. 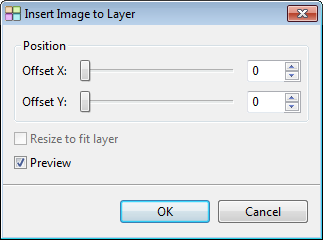 Select the layer of the image which has just been loaded by clicking at the layer "Layer 1". The "Layer 1" will now be highlighted. We are going to apply drop shadow to this layer. 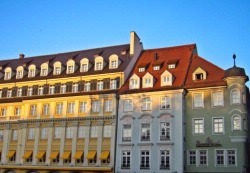 By default, transparent borders are added to the image. In this case, the image which we are going to apply drop shadow is smaller than the one that is underneath. We do not need this option. Turn off the option "Add transparent borders". 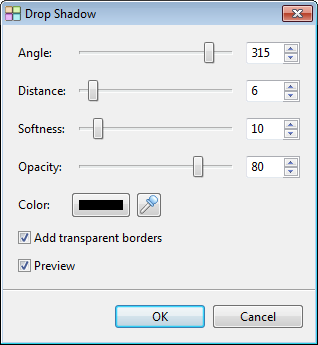 Change the values of Distance, Softness, Opacity and Color to customize the shadow. Press the "OK" button when you are satisfied with the settings. 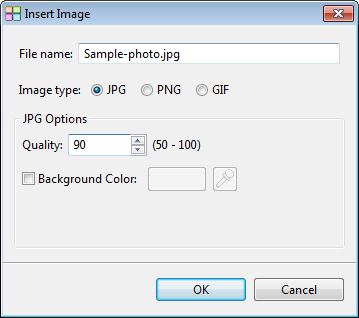 Select the image type in the Insert Image Dialog. In this case, we choose "JPG". Give this image a name. We will use "Sample-photo.jpg". We set the quality to 90.